For unique special offers on all our new and pre-owned Volvo vehicles in stock as well as our wide range of services for Volvo owners, Volvo de Québec is your number one destination. We continually update our special offers and promotions on all Volvo products, vehicles or services we offer. 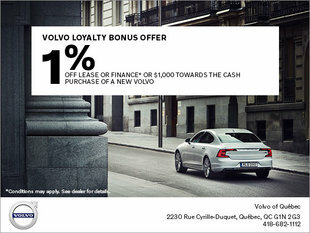 At Volvo de Québec, we know it's important to give you more for your money. That's why we offer a wide selection of promotions and discounts as well as seasonal special offers. We want to give you more for your money at Volvo de Québec and that's why you’ll find discounts on all our products in inventory. Volvo de Québec has special offers and discounts on most of our new vehicles as well as our certified Volvo pre-owned vehicles. Whether you’re looking for a sedan like the Volvo S60 or an SUV like the new Volvo XC40 or XC60, our special offers will help you save money. It's not just new and pre-owned Volvo vehicles that benefit from impressive special offers. We offer discounts on all our after-sales services such as mechanical and detailing maintenance, our tire centre and our body repair services at our specialized body shop. Come in today or visit this page often to discover our special offers and our latest discounts. No matter which Volvo vehicle you want to buy, the financing or leasing plan you need, or the after-sales service you're looking for, you'll save money at Volvo de Québec. Giving our clients more of everything is our philosophy. Come and meet us today at Volvo de Québec to learn more about all of our services and products.